Malayala Manorama's Long awaited entertainment channel Mazhavil Manorama is coming to television on 31st October. Malayala Manorama informed that the official lauching of the channel is scheduled on 31st October as a gift to Malayalis for Kerala Piravi on November 1st. Mazhavil Manorama is a complete entertainment channel. The entry of Mazhavil Manorama will create a race with the television media dominating Asianet Network and Sun Network. The management informed that the transmission testing was carried out and the channel is ready to make its official launch on the scheduled date. Mazhavil Manorama Director Jayanth Mammen Mathew said “I am hoping that Mazhavil Manorama will become the No. 1 Malayalam channel. It will definitely take some time, but eventually we are hoping that the stage would definitely come.” They used print, radio, out-of-home, digital and social media as part of its advertising mix for the new channel. 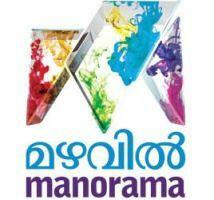 The launch of Mazhavil Manorama will strengthen Manorama's operation in television media. The logo is designed to resemble the name of the channel, denoting a 'M' as in Manorama News and carrying all the colours of a rainbow. Like a rainbow, they have included a wide variety of programmes in their channel. Mazhavil Manorama has taken the television right to show many new malayalam movies. This includes new Malayalam movies Thriller, Cocktail, Marykkundoru Kunjadu etc and Some Old Movies Like Runway, Rasikan, Aparichithan, Thaskaraveeran, Gourishankaram, Hridayathil Sookshikkan, Annorikkal etc. Two Reality shows are also included in the channel. One among that is a Musical reality show named Josco Indian Voice Music Show coming with 25 Young Singers Including a Pakistani Singer. Shankar Mahadevan, Sujatha and Sreenivas are the Judges of Josco Indian Voice Music Show With Stephen Devasy. They have also included serial shoes written and directed by notable artists in Kerala. All these you can start enjoying from 31st October onwards. The coming of Mazhavil Manorama will add more colour to Malayalam television media.